Quinoa (Pronounced Keen-wa) is a complete protein all on its own. It is high in protein, calcium and iron, a relatively good source of vitamin E and several of the B vitamins. It contains an almost perfect balance of all eight essential amino acids. Another upside is that it is gluten free! Technically quinoa is not a true grain, but is the seed of the Chenopodium or Goosefoot plant and it comes in three different colors - white or sweet variety; a dark red fruited variety called red quinoa; and a black quinoa. There are different ways to cook Quinoa but generally it's cooked like rice (can even be cooked in a rice cooker). This is my favorite..
Place water and onion powder into a pot and bring to the boil While this is happening put the oil into a large pot and heat. Then add the quinoa and keep stirring to coat and toast. When the water boils add to the quinoa (carefully). Stir a little to make sure the quinoa is fully covered. Place lid on pot and simmer for 20 minutes. When done lift the lid and with a fork make sure the water has all gone....if there is water left, replace the lid and turn off the heat until ready to serve. Cooked quinoa is wonderful tossed with either winter roasted or summer salad vegetables. It can be used instead of rice or tossed with tofu. You can also put it with shallots, spinach, olives and crumbled feta and stuff it into a portabella mushrooms and bake or a creamy quinoa mushroom casserole with spinach, dill, lemon, and a crunchy Parmesan top. And don't worry if you have plenty left over you can use if for tossing through a salad for lunch (even take it to work) or add to a stir fry for dinner. The possibilities are endless once you learn how to cook with quinoa. In this wonderful book sisters Patricia Green and Carolyn Hemming show you how to use this miraculous superfood in all your favourite dishes. A wonderful addition to any recipe bookshelf! 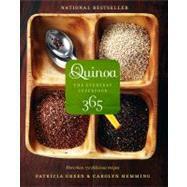 Like all other quinoa recipe books it does contain meat recipes, but easily adaptable for vegetarians.